The last year was a successful one for the club’s Community Service activities, giving away a total of nearly £7000 to over a hundred worthy causes. We handed out £4156 at Christmas for the benefit of more than ninety individuals and families, who received case or cash plus a Christmas hamper. Treetops Hospice received more than £1500 and PASIC (Parents Association for Seriously Ill Children) a further £250. The club also donated money to volunteers wanting to participate in educational projects in Mexico and South America. We bought a bike for a local lad who helped deliver prescriptions to the elderly of the area, but who had his original bike stolen. 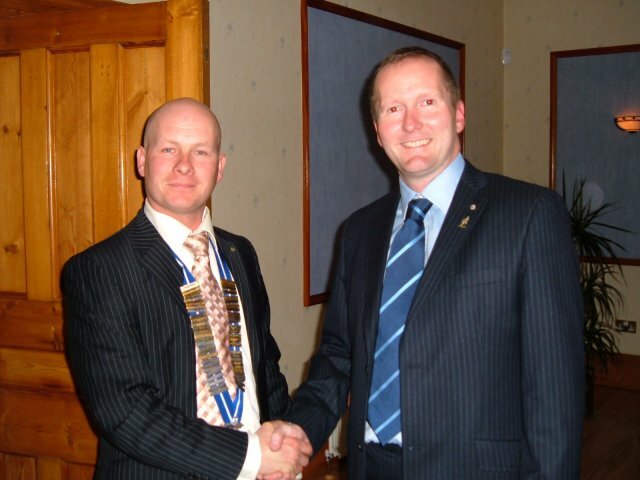 Members of Long Eaton Round Table have appointed Dave Welch as their new Chairman for 2008 – 9. 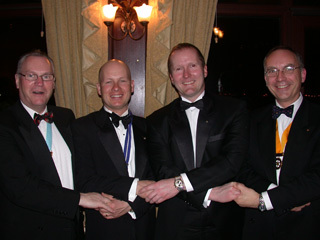 Former Chairman Dave Liddington is seen here on the right presenting the Chain of Office to the incoming Chairman. On the same evening, Mark Elm was appointed the new Vice Chairman and Mark Shaw becomes the new Club President. The members, who live or work locally, enjoy a variety of social events and raise money for local good causes. Members of Long Eaton Round Table held their 53rd Annual Charter Night on Friday 4th April at the Trent Lock Golf Club. Chairman David Liddington thanked everyone for attending including the Area Chairman Kevin Horn, Area Vice Chairman Patrick Maxwell , Rotarian Richard Cliff , all members of visiting Tables and obviously members of Long Eaton Round Table. Special thanks was given to the staff at Trent Lock Golf Club for their excellent service on the evening. The speaker for the evening was comedian Mick Miller who entertained the audience with funny stories and tales of his career . Long Eaton Round Table Support Long Eaton Community Carnival Association with 50 Cones!